Lyman Sabot Moulds from Mihec. Thread: Lyman Sabot Moulds from Mihec. Mihec currently has the Lyman Slug moulds in stock ready to ship. I just got an email from them today. 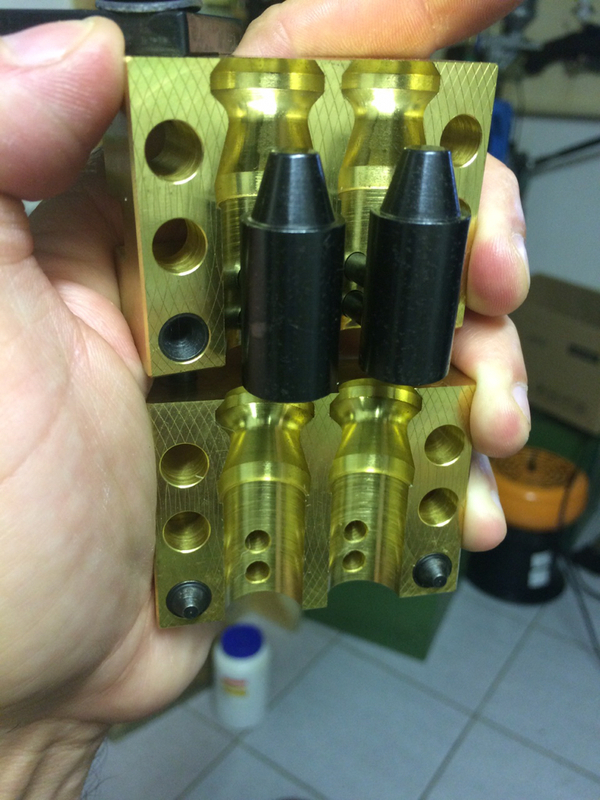 These are Brass 2 cavity and look like typical Mihec moulds IE pure jewelry! Thought I'd put it out there as we on this forum are most likely to benefit from these moulds. Best mold I own. Gets heavy after a while but dumping 2 at the time great slugs pile up quickly. I still don't have one of these and in all honesty I would like the Mihec version if I get one. - smoothbore: 50 yards? 100 yards? - rifled choke tube: 50 yards? 100 yards? - fully rifled barrel: 50 yards? 100 yards? I read many contradictory posts about this slug. What sort of accuracy do you get with what components in smoothbore and/or rifled barrel? Pics of targets would help. I'd also like to get some info from someone who bought the Mihec bore diameter version. I figured that would be the slug to get ~ eliminate the variability of shotcups! Like I need another slug mould! But I want one!! I'm just not sure I will see any benefit from it. rifled barrel last year in a full value crosswind left to right around 10 - 12 mph. the orange dot is 1 1/2 " this one shot group was 103 ranged yds to the heart leaning against a tree. Kent, I shot some at 140 yds a couple of weeks ago, no pic but about 7" group and about 12" drop. Same day had a couple left and shot out of smoothbore w/red dot, 50 yds, 3 - 4" apart. You won't go wrong with that mold. Last edited by Hogtamer; 01-27-2019 at 11:42 PM. LB: I look at it this way when I buy gun stuff . If it doesn't work out I can always sell it. I already have a buyer for my latest shotgun mistake. If you think you want one of those moulds, I would not wait very long as they are selling fast. Nice shooting Hal! Those are certainly what I would call more than acceptable groups. Randy: No. I do not really consider reselling as an option though I should. We don't have the market you do in the States but I am sure moulds would sell... and I can sell to Americans so really that market is open for non guns or gun parts. Moulds and other reloading gear are okay. Money has been a bit of a concern as my work was pretty sparse through the fall and I have more stuff than I use anyway so I have a hard time justifying buying stuff I may not need or use. But having said that I do wish I had jumped on that rifled barrel for the Slugster. At $150 CDN it was a good buy. I figured I'd have my slow twist rifled choke tube done by now but... not yet! Still having cutter issues. I went to a single hook cutter but it bit too much so I changed it to a scrape cutter and that seems to work fairly well except the choke tube is so short I get tipping with the single point cutter. I think I will have to go with at least two teeth or maybe three. I know three teeth will not all contact and cut but at each end of the stroke if only one tooth leaves the bore the other two will help keep the cutter from tipping. Even though I see mixed reviews on the Lyman sabot slug or clones I'd like to try some. There is a local guy here (Ginsing) who has some of the Russian moulds and the Lyman clone is one of them so he is casting me some to try. By the time I shoot them the NOE and Mihec moulds will likely be gone but such is life. I have lots of slug moulds and the Lyman single cavity mould will still be available if I really want that slug and NOE, Mihec and the Russian moulds are not. I have one of these as well, casts great. I made 500 slugs with the Lyman single cavity mold one day during Christmas holidays. Double would be ... double. More is more. It isnt just double, it is also using a cramer style base plug, much faster than using the Lyman style removable pin. I decided to buy this but all this forced "register a new account and wait for your code" -yoga is not my piece of cake. I do not want to "register" anywhere to buy one mould. Or buy anything really,already got enough usernames and passwords and spam mail for this life. Places like Titan make shopping simple with a working guest account. Just write him what you want and in few days he will get back to you and he will ask for your PayPal address. I am not registered and I do get most of his molds this way. Have this mould also, you will not regret buying it, but you could regret not buying it because there are not many 2cav slug moulds that casts so effortlessly and mostly they are not in stock. Now that is a beautiful piece of work! Mihecs moulds are often referred to as jewellery and rightly so! I know the reputation,lots of happy people with Mihec moulds. I'd like to be one,life is too short for bad tools. EDIT: Ok I bit the slug,went on and registered. And ordered. The original Lyman slug is such a good drop-in for my "economy-traploads", I want this mold for many reasons,one being brass. Last edited by Petander; 02-07-2019 at 08:38 PM. I'm completely spoiled now. Thank you all very much for the heads up,casting with this is pure magic. Mihec makes a mould second to none! Mine are all terrific. If I had more toy money I'd have more Mihec moulds! Mine was supposed to be here today but maybe tomorrow. Now there you go confusing me again! I thought you didn't like the Lyman sabot slug? Didn't you just get rid of a mould? Lost the base plug for my Lyman in the fire. I would like one of these but can't get into my account. Tried the forgot my password but I keep " failing the spam check". I haven't forgotten how to do arithmetic.